For the treatment of superficial skin infections caused by yeast, jock itch, ringworm and athlete's foot. Helps reduce friction and shearing. 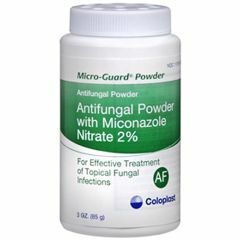 AllegroMedical.com presents The Micro-Guard Antifungal Powder. Non-caking. For the treatment of superficial skin infections caused by yeast, jock itch, ringworm and athlete's foot. Helps reduce friction and shearing.